Description Of Item: The older brother of Duncan, Randors first Man-At-Arms, Malcom served under King Miro during the Great Unrest but was wounded in battle and stricken with magical amnesia. Wandering through Eternia, he settled in the Mystic Mountains in a mining settlement, unable to piece together how he lost his battalion. His life changed when the Snake Men attacked his town and he helped save the Masters of the Universe from their trap. But in doing so, Malcom shattered his right hand. In gratitude, Duncan replaced it with a robotic strong arm. 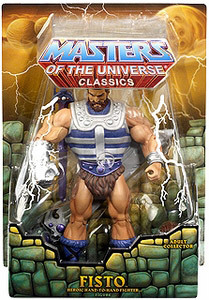 Now known as Fisto, he has made up with his brother and fights as a heroic member of the Masters of the Universe smashing evil with his giant knuckles!